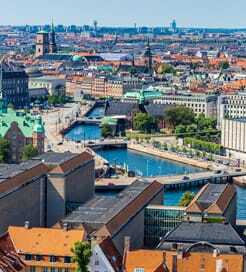 Denmark is a fine destination in itself, but its location in the south of Scandinavia means travellers can easily pass into neighbouring Germany by road or take a ferry to Sweden and Norway as well as providing a good link by sea to Iceland and the Faroe Islands. Copenhagen is the main tourist destination in the country. It's most visited attraction is the Tivoli Gardens, a large amusement park that has been open since 1843 and is packed with thrill rides as well as a theatre and stunning exhibition halls.